If you took all of current tweets, posts, and blogospheric bits floating through cyberspace that chronicle America's current relationship with food, edited them together, and then published them as a book seventy years in the future, it will do to the present-day what's done for the mid-20th century by Mark Kurlansky's The Food of a Younger Land: A Portrait of American Food--Before the National Highway System, Before Chain Restaurants, and Before Frozen Food, When the Nation's Food Was Seasonal (buy on Amazon ). Kurlansky's book couldn’t be more timely: much of the material Kurlansky compiles in the book was written during the Great Depression, when magazines and newspapers were folding by the score, and the worldwide political-social macrocosm seemed teetering on the brink of unmitigatable dissolution. Against the background of all that, The Food of a Younger Land presents a shrewdly curated cross-section of the culinary landscape of the 1930s and '40s. He's gathered together snapshots of the recipes, sugar-offs, barbecues, raucous feasts, and feisty fries that constituted American cookery, all of which was local, sustainable and regional without even trying. And it's all within the context of a larger, more poignant portrait of the foodways and familiy traditions of tight-knit, often ethnically uniform communities in their last days before highways, fast food, and fast living took over the country in the heady post-World War II '50s. The Food of a Younger Land was conceived when, almost by accident, Kurlansky dug up the shaggy remnants of one of the Works Progress Administration’s pet projects. President Roosevelt established the WPA to provide much-needed livelihoods to swathes of unemployed workers, creating jobs in fields ranging from construction to science to the arts. Kurlansky's discovery, the Federal Writers' Project, was an arm of the massive WPA. The program set out to provide both a launching pad and a safety net to anyone who could reasonably be identified as a writer, even in the most literal sense of the word: from laid-off secretaries and typists from shuttered newspapers, to rising literary luminaries, like Saul Bellow, John Cheever, Richard Wright and Ralph Ellison. When it began, the FWP issued wonderfully illuminating guidebooks to America (many of which are still in print today). Perhaps sensing modernity’s slow encroachment (or merely running out of geographical space to explore and explicate), in 1939 the FWP cooked up a new literary scheme — "America Eats" — dispatching writers around the country on fact-finding, pseudo-anthropological missions to gather recipes, tales, and generally get a sense of how the country’s various regional food traditions came into being. The project, staffed and run by a variety of what could be politely described as “characters,” was mired in chaos from the get-go. 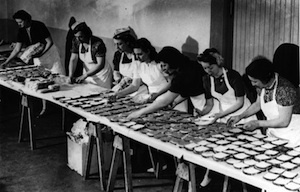 Then Pearl Harbor happened, and America Eats – the project itself, along with reams of unedited manuscripts, in various states of disrepair – was packed up in five boxes, eventually landing in the Library of Congress. Kurlansky stumbled on the partial manuscripts (many entries were never sent in, were lost or destroyed in fires) completely by accident, while researching another book. Like all cross-sections of large groups of writers, some of the fruits of the America Eats project are juicier than others. The Food of a Younger Land is analogous to the varying calibers of, say, contemporary food blogs — while there is no shortage of the capable, witty and original, there are many more barely literate, aggressively uninteresting and often wildly inaccurate bumblers babbling on and on about food. To his credit, Kurlansky clearly made it a priority to cherry-pick the zestiest dispatches, only occasionally leaving in a bland clunker whose presence is redeemed by an ability accurately flesh out a region’s portrait. The result of this curatorial work is a fascinating — if scattershot — portrayal of an America on the tipping point between home on the range and home of the Range Rover. And while The Food of a Younger Land is a minor literary gem thanks to contributions from Eudora Welty, Zora Neale Hurston, Nelson Angren and dozens of other extraordinarily talented, but less noted writers’ work appear in The Food of a Younger Land, the additional inclusion of culinary neophytes' scrambled scribbles adds a charmingly home-spun, hilarious, and honest tone to the writings. Each region covered — Kurlansky divides his book into the Northeast, the South, the Midwest, the Far West and the Southwest — dishes out a mixed bag of classic and oddball recipes (you never know when the urge will strike to whip up Maine squirrel pie, Florida rattlesnake snacks, Washington wildcat or Indiana persimmon pudding); in-region rivalries (questions of the best way to cook clams, beans, or corn inspire particular backbiting, as does the appropriate manner in which to prepare and dress various adult beverages); and bizarre superstitions (the Navajo of the Southwest counsel never to eat food in which a knife-point has been thrust, as it carries with the curse of lightning stroke; Colorodoans darkly warn only to make vinegar when the moon is full). The sections also manage to variously both dispel and confirm stereotypes commonly held about the regions. The writing in the Northeast section is highbrow and knowing (“Seemingly no literary tea is successful unless it is crowded enough to make an exchange of intellectual ideas an impossibility”), but also endearingly innocent (customers at New York soda-luncheonettes would often employ rather colorful slang when ordering food: “bang one” for a malted milk, “twist it, choke it and make it cackle” for a chocolate malted milk with egg). Much of the writing in the South betrays distressing notions about African-Americans (unsurprisingly for that era, a large number of the participants in the FWP were white), while the Midwest gives us data-heavy, bare-bones, no-nonsense recipes and narrative. The writing from the Far West is rough and straight-forward, and the Southwest produces a strange brew of the stoic and the flaky. Apparently, the often preposterous obsession with health in L.A. is nothing new; some restaurants, even then, offered alfalfa dust and sodium glutamate in place of salt and pepper. Wheat germ porridge was all the rage, as was salad spritzed with an unholy conglomeration of lemon juice and honey. The Mexican food was unbeatable in California too — it’s nice to know some things never change. As a writer, Kurlansky is noted for his ability to pluck singular and peculiar-sounding book ideas from the ether and spin them into brilliant, timely yarns (think of his previous bestseller, the unlikely yet riveting Cod: A Biography of the Fish That Changed the World (buy on Amazon ). The Food of a Younger Land hews to the pattern: the various primary sources are introduced, compiled, analyzed and shepherded throughout, with Kurlansky introducing and providing context for each regional section and many subsections. 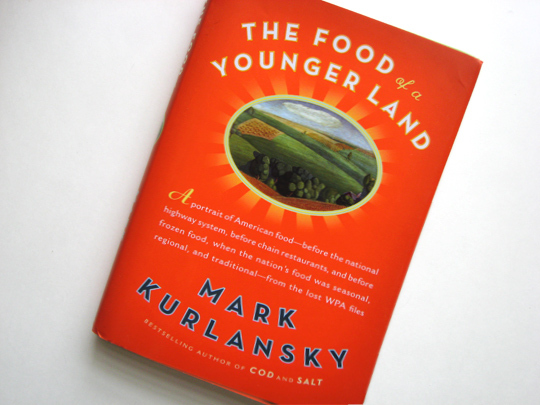 The idea of reading a book that regurgitates superannuated family recipes from Oregon and Maine and the cookouts at which the comestibles were chomped might sound like a chore to many readers, but with Kurlansky as a guide, it becomes a must-read for just about anyone interested in American history, food and society.